This is a match-up between two teams who are no strangers to each other, and we could be in for a tight affair. In the last twelve games between the two sides, the honours are even with six wins each but interestingly, the away side has triumphed in 8 of these 12 games. Will this pattern continue on Thursday night? Laboral have won their last two games in a row and they currently top the group with a 2-1 record, just edging ahead of Anadolu. The form of the Spanish team has been impressive and they have the last two weekly MVPs of the Euroleague, so they are clearly a team to watch. Darius Adams and Ioannis Bourousis were the players honoured for their play that has powered Laboral to the top of Group B. This week, it may be Adam Hang that steps forward to be the difference but Laboral have plenty of players that can make a difference. The Turkish side got off to a flying start in the Euroleague this season, winning their opening two games and looking in good form. However, they were dented last week when they lost at home to Cedevita. However, they know that another away win this week will see them back at the top of the table and with Dario Saric and Bryant Dunston in their side, not too many would be rushing to bet against them. Thomas Huertel will be fired up for a win against his former side and he could also figure strongly if the Turkish side grab an away win on Thursday evening. 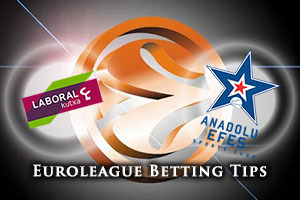 The hosts are favourites but taking Anadolu Efes Istanbul at +5, with odds of 1.90, may not be a bad bet. If you are looking to enjoy the Over/Under market, be sure to go UNDER 160.5 in this one between two teams who may want to keep things tight for as late as possible. Bet Now!